As mentioned earlier this morning, it's too hot to cook anything that requires indoor heat. In my book, that means cold soups. Now, everyone (hear this, men) may think cold soups are the height of girly food, but they can be rich, filling and quite satisfying. The key is to come up with a cold soup that's got some soul to it. Therefore, I put beans in my gazpacho to give it some body (see recipe under What's Cooking Tonight). And nothing -- nothing -- beats avocados for adding some heft to a soup. Avocado soup also lets me use a bunch of cilantro before summer's heat chases it away for the season. You can do this in a food processor or use an immersion blender in a big bowl. The goals is to take all the ingredients, beat them to smithereens, then chill an hour or two and serve. If you want, top with some chopped green onions, a little sour cream and a dollop of salsa. 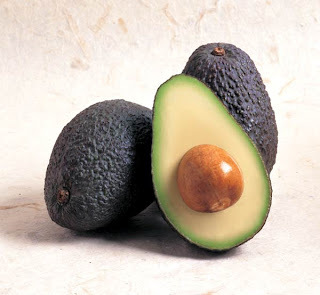 Photo courtesy of California Avocado Commission, which has more recipes.